Sheriff Shoar added 5 new photos. Sheriff Shoar added 2 new photos. If you have access to commercial or residential locations on main roads in our community (US 1, SR 16, SR 13, SR 207, SR 206, CR 210 and A1A) where we can place our larger commercial signs, please email us at david@sheriffshoar.com or fill out this quick form > http://goo.gl/eynj4b. We plan to put up the signs in early July. Thank you for your support! CAMPAIGN GEAR – Show your Shoar for Sheriff support with free yard signs, decals, hats and t-shirts. Here are 3 easy ways to get your campaign gear. 1 – Visit the website (www.sheriffshoar.com) and fill out the quick and easy form to request a yard sign or decals. The yard signs will be delivered and decals will be mailed. 2. The South Jersey Chapter of the 82nd Airborne Divn. Assn., Inc. is named the "CPL Edward A. Slavin Chapter" after my late father: my dad was a morale non-com, a machine-gunner who taught map-reading, a paratrooper, a wounded, thrice-decorated veteran of three World War II combat jumps (North Africa, Sicily and Normandy). My father is buried in a national cemetery. 3. Our war veterans buried at our St. Augustine National Cemetery include veterans of every single American war since the 1830s, including the Seminole Wars and the Civil War. Some of the honored dead here are former slaves, whose graves are identified on gravestones as "U.S.C.T." (U.S. Colored Troops). 4. 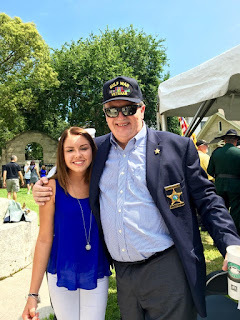 Thus, your offensive Facebook ad -- featuring a photographic image of you wearing sunglasses, smiling a goofy grin with a "Gulf War Veteran" baseball cap, posing for photographs, at St. Augustine National Cemetery on Memorial Days 2016 -- dishonors our deceased American veterans' memories and burials here, and everywhere. Our veterans are not your props, Mr. Shoar. Our St. Augustine National Cemetery is not your advertising venue. You have violated federal law in your despicable, desperate re-election political campaign for Sheriff in the face of your coverup of the Michelle O'Connell shooting and sequelae. 5. Political ads filmed in national cemeteries are a stench in the nostrils of our Nation, unseemly and illegal, Mr. Shoar. 6. How much did your extravagant $229,000+ political campaign spend on filming you and sharing the St. Augustine National Cemetery ad on Facebook? Why? Ar you now or were you planning on using footage in television advertisements, too, Mr. Shoar? 7. How many Facebook readers have read it or received it? Please provide documents and invoices. How many Sheriff Shoar re-election campaign cards did you distribute at the cemetery on Memorial Day? That activity, too, violates federal law, Mr. Shoar/Hoar. 8. Who wrote and produced the Facebook ad and why? Please provide documents on script approval and payment pursuant to F.S. 119 and Article I, Section 24 of our Florida Constitution. 9. Did St. Augustine National Cemetery management ever give you or those acting in concert with you written permission for filming a political ad? Please provide any documentary evidence for any such assertion pursuant to F.S. 119 and Article I, Section 24 of our Florida Constitution. 10. Please provide all documents on the St. Augustine National Cemetery ad. 12. Both U.S. Senator John McCain and U.S. Congressman Kevin Cramer wisely cancelled their own mendacious, meretricious political ads, filmed in two national cemeteries at Arlington, Virginia and in North Dakota. 13. Former Florida State Rep. Ronald "Doc" Renuart, M.D. a former National Guard Colonel, used such an ad filmed at St. Augustine National Cemetery in 2014, ignoring my cease and desist letter. He was defeated in his 2015 race for State Senate, against Travis Hutson, who is now our State Senator. 14. Your having served in the Florida National Guard means that this is no innocent mistake -- you knew or should have known federal law, but chose to ignore it. Your posting a Facebook ad filmed in St. Augustine National Cemetery is hurtful, intrusive and deeply insensitive to all veterans and their families. It shows an utter and crass unwillingness to adhere by reasonable standards of probity of a Florida National Guardsman and an American candidate and elected official. It shows you have learned nothing from the prior partisan political misconduct of Senator McCain, Congressman Cramer and State Rep. and FNG Colonel Renuart in filming ads at national cemeteries. As the old song says, "When will they ever learn?" 16. Please apologize publicly for your Facebook ad photos staged in our St. Augustine National Cemetery and for handing out campaign cards there.